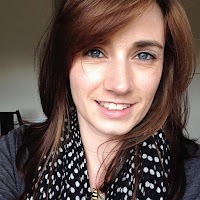 Well Crafty B's we have another Meet the Maker for you and this one is exciting on so many levels. Alison Nicholson is a textile artist who will be exhibiting at the the Sewing for Pleasure, Fashion, Embroidery & Stitch and Hobbycrafts shows at the NEC this March (you know about this right?!) 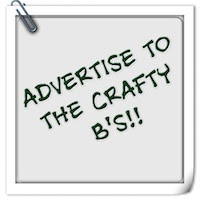 Once we have met Alison and here featured item, I am going to tell you about your exclusive Crafty B's discount that you can use at her stand at the show and there might also be a little giveaway! So lets find out more about Alison! Where you are from and can we have one fact about you that we might not otherwise find out? I live in Barnstaple, North Devon and I live in a barn conversion with my husband and 2 cats. So you will be attending the ICHF craft shows in March at the NEC in Birmingham. What will you be exhibiting? I will be exhibiting a lot of different accessories such as felt scarves, jewellery and hair decorations and possibly 1 or 2 textile pictures and some 3D pieces. My signature is stitched water soluble fabric so that features in nearly everything I make in 2 or 3D! I will be taking a sewing machine with me so that I can demonstrate stitched water soluble fabric. I will probably demonstrate some simple felting techniques also. Sounds fab! I can't wait to stop by! Where will we find you? I've written that in my notebook for the day! So what item are you sharing with us today? 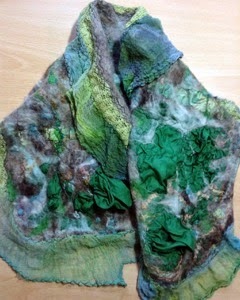 The image shown is of a felt and silk (Nuno) wrap embellished with stitch and trimmed with dyed scrim and lace. I call it “Cottage Garden” because although it is mostly green there are little bits of colour such as pink (roses) and orange (carrots). Thats what it reminds me of anyway! How long have you been working with textiles and how did you learn to create such lovely items? I have been a textile artist for a few years now but I started felting after I went to the Stroud textile fair and saw someone wearing the most beautiful jacket I’d ever seen. 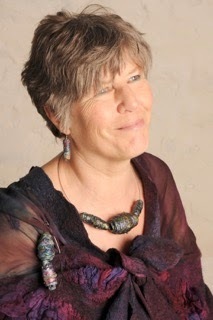 I invited her to come to North Devon Arts to talk about it and demonstrate how to make felt. I discovered that Jill Denton had helped her to make it. Jill is a well known textile artist and also local so I vaguely knew her. I then bumped into her at Twisted Thread at Alexandra Palace - she invited me to join the FLEWS group who exhibit at Twisted Thread and I subsequently attended some of her workshops. I have only been felting for a couple for years and have a lot to learn. What I love is the embellishment part - I like to add stitched water soluble fabric, lace, scrim, beads and stitch. If I am making a hair decoration of a corsage I like to add crocheted wire. Wow it all sounds very detailed and intricate. I look forward to seeing some of your work at the NEC shows! When and why did you start your business? I started my business about 15 years ago after taking redundancy and going back to college. I did an Access course in art and design, then went on to do a foundation degree in Spatial Design. I set up my interior design company but became fascinated with the fabric samples that arrived through my door and started stitching with them, creating pictures which I sold in local galleries. A few years later I did a top up in Fine Art to get my Degree, focusing on textiles. What keeps you motivated and where do you take you inspiration? I have no trouble staying motivated - one thing seems to lead to another and there is no other way I would rather spend my time than making things. When it comes to inspiration; I live in a beautiful part of the world so I can’t help but be inspired by the landscape, particularly the sea. I am also attracted by rusty metal, distressed doors, lichen, skeleton leaves, the sounds of leaves rustling, shadows, waves lapping - everything really! 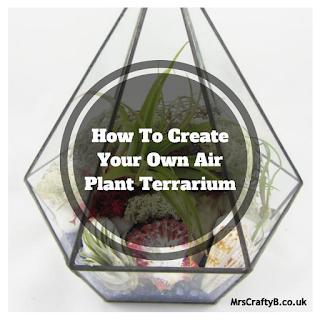 What is it like to have your own craft business? For anyone out there who wants to make a living out of craft I would say “you won’t!” I have other jobs to make ends meet but I absolutely love what I do. The best thing about attending craft shows are the people and the products- it is totally inspiring. Its also a huge buzz if someone likes your work. Will you be attending any other shows this year? I will be at *ExCel the week following the NEC and then I will be at Alexandra Palace in October where I'll be teaching workshops as well as exhibiting with FLEWS in the Resource Centre. So we will see you at the show but how can we find you online? You can email me at alisonsnicholson@icloud.com . My sites (which currently link to Etsy) are alisonnicholsontextiles.co.uk and alliedesign.co.uk . I am on Facebook and Twitter and I have also recently been invited to post my work on “Wonderstreet"
Great! So to finish can we ask some quick fire questions; for fun? What do you like to do except craft? The last gift you bought/made someone? Thank you for taking the time to chat with us Alison. I can't wait to see your work and your techniques at the show; but we're not done just yet Crafty B's. As you are all so fabulous, Alison if offering you an exclusive 10% discount! Just take the following code when you visit Alison's stand (ZH24) at the Sewing for Pleasure, Fashion, Embroidery and Stitch and Hobbycraft shows at the NEC 19th - 22nd March. Are you ready? This code is especially for you and is only for use at the above show. Get it written down and if you haven't already got your tickets for the event, enter our giveaway here to win a pair of day tickets! Keep your eyes peeled for another giveaway with Alison later in the week.